We still very much like the G4 Plus, but if you're after a truly budget purchase then, as it turns out, the standard Moto G4 does the majority of what you'll need just fine. When you think "Plus" in the phone world you tend to think extra large handset. It's all Apple's fault. But that's not precisely the case with the Moto G4 Plus: sure, it's pretty large with its 5.5-inch screen, but it's the same size as its Moto G4 brother. The difference is all down to the feature enhancements it embodies. In summary: the Plus has a better camera, adds a fingerprint scanner, has 32GB minimum on-board storage, can be RAM-upgraded at point of purchase (£38 additional), and includes a TurboPower charger in the box for fast-charging. All notable points compared to the standard Moto G4. But the Plus is a minimum of £60 more, starting at £229. Which puts the typically budget Moto G into lesser known waters. The original Moto G from 2013 was all about being compact, cute and budget, whereas the Plus version of the fourth-gen model is sailing dangerously close to the likes of the OnePlus 3 in terms of price - but without the flagship features to match. Is it all plus, then, or are there some minuses to consider? In terms of design the G4 Plus is virtually identical to the G4, except for that very obvious rounded-edge square-shape fingerprint scanner to the front. Which looks and feels far too much like a button that we can't stop trying to press - which isn't great in terms of design. On the whole, then, our thoughts about the G4 Plus are much the same as the G4 regular. It's pretty big in the hand for a regular phone, its 153 x 76.6mm dimensions necessary to contain that 5.5-inch display. At 9.8mm it's a little slimmer compared to earlier Moto G models, but it's hardly a slender phone. The look and feel of the Plus, like the standard G4, is more sophisticated than earlier Moto G models too. It's done away with the not-so-pretty silver "bars" around the speaker grilles that dragged the third-gen Moto G down. It's also coated with a protective coating, called P2i, meaning its innards are water-repellent. Very handy should you accidentally drop it into a puddle/sink/bathtub. We rather like the look of the textured removable polycarbonate back, as it avoids looking too budget. It can be tailored using Moto Maker (the company's personalisation ordering tool) at purchase to be all manner of colour options too, without affecting the price. However, at the £229 price point it's only £80 shy of the OnePlus 3, which has a much better all-metal build. 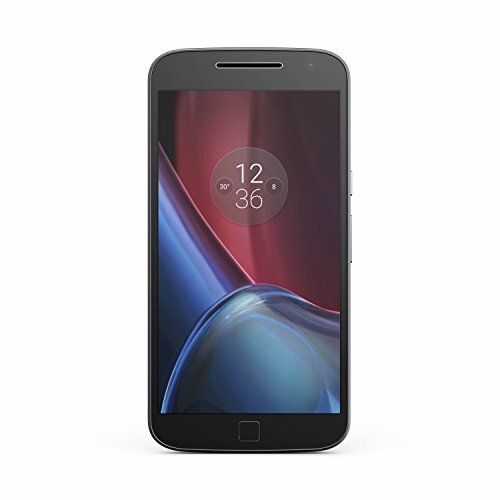 In that sense, the G4 Plus has lost its sense of being a truly budget phone: it's a little too expensive to be considered in the same frame of reference as the original Moto G.
The new Moto G sports a 5.5-inch display with a Full HD resolution (1920 x 1080 pixels, resulting in a pixel density of 401ppi). Not super-high resolution, but it does the job just fine. We've not felt like our eyes are staring at giant square pixels anyway. As we said of the standard G4, however, it's not the very brightest display out there, keeping with its budget positioning. It can't hammer out the same level of luminance as our LG G5, for example, but it's still got more than enough welly to survive both indoor and outdoor lighting conditions from all manner of viewing angles. We've also spotted that the G4 Plus's screen has a yellowish, muddier cast compared to the standard G4. This may differ per device, as each won't be specifically balanced to match, but it's a point to note nonetheless. Ultimately, in our review devices, it's the standard G4 that's preferable (despite both having identical screens). Now the performance of the G4 Plus is the one major part where the phone could be better than the G4 standard. But in the case of our review unit that's not the case: it comes with the very same 2GB RAM and Qualcomm Snapdragon 617 processor at its core. Now, using Moto Maker, there is a 4GB RAM option - simply buy the 64GB on-board storage version of the phone. It's a bit more expensive again, though, at £264. And because we've not received this model for review we can't tell how much genuine difference it makes in practice. No 6GB RAM as per the OnePlus 3 to be seen here. If you opt for the 32GB G4 Plus then, well, its performance is identical to the standard G4. We've performed the same tasks with both phones and its results are the same: when playing Farm Heroes Saga, for example, all the animations are lovely and fluid with no stuttering to be seen, but there's a 15-second delay to load the app. It's very much a mid-range experience. One obvious performance difference in the Plus is the inclusion of a fingerprint scanner. Ok, so it looks far too much like a button, but as scanners go it works fairly well. Multiple finger/thumb presses to register a print take little time, with the phone guiding you through the process. It's then a case of slipping the registered digit over the scanner for quick fire sign-in, which is preferable to PIN or pattern entry. There are issues though. One, it's not the quickest scanner on the market; two, we much prefer recessed scanners on phones' rears for practicality's sake; and three, there's no NFC. Let that last point sink in for a moment: it's 2016, it's all about Android Pay, but without that feature the G4 Plus forgoes a very obvious benefit. Therefore the inclusion of the scanner feels self-impaired. Ultimately the G4 Plus feels like the OnePlus 2, but just after the OnePlus 3 has launched - i.e. it's a year late - that doesn't quite cut it. The Moto G4 Plus sports a 3,000mAh battery, which is a fairly generous capacity for a phone running a relatively low-spec chipset. That's good news, though, as it means decent battery performance that will easily get you through the course of a day. We've not felt it be any different to the standard G4, but heavy camera use and fingerprint scanning may cost it slightly more power-drain. As before, Motorola claims a full 24-hours of use. We found that optimistic, but have been seeing 30 per cent battery left in the tank before bedtime. Not bad at all. Best of all is the G4 Plus's inclusion of the TurboPower charger in the box - which is roughly speaking the company's rebranding of Qualcomm Quick Charge 2.0 - meaning super-fast charging times. From zero to full takes around 90-minutes, but the battery can fill in quicker time anywhere up to the 80 per cent mark. The standard G4 supports this battery tech, but doesn't include the charger in the box (it's a £25 accessory). Other than programming the fingerprint sensor and any app interactions possible with this feature, there are otherwise no differences between the G4 Plus's software and the standard G4's. Which is a good thing, because this phone is all about base level Android without too much messing about. There are some Moto additions, as ever, such as gesture controls, which are ultimately similar to previous Moto G, E and X handsets. However, as Android has got more sophisticated over time, Motorola has filtered the amount it offers to avoid duplication. The result is a fuss-free experience. Those gesture controls will let you do things like flip the phone to silence it, or make a chopping action with the phone in hand to turn the torch on. There's a display option to give you ambient notifications, and dark screen time settings to avoid disturbances at night. And that's about it. Good job. Here's the last big difference the Plus adds over the G4 standard: its rear camera is not only more resolute, at 16-megapixels (not 13MP), but offers a laser autofocus system for enhanced low-light focusing too. The aperture, at f/2.0, is one and the same, as is the front 5-megapixel selfie cam. Otherwise the camera implementation is one and the same between two devices. The dedicated camera app is fast to load, and in its default auto mode offers one-touch HDR (high dynamic range - used to balance shadows and highlights), flash and self-timer options to the left. There is also a pro mode, found in among the other video and panorama options (via the icon to the top right). Low-light focus is pretty good thanks to the laser autofocus, but it's still not the very quickest you'll find in a smartphone. Again, though, this is budget - the G4 is not going to match the Samsung galaxy S7 edge, for example. Beyond auto you can amp things up and take full manual control in pro mode. That means full control over white balance, ISO sensitivity, manual focus, exposure compensation and - unusually for a smartphone - shutter speed (this will be electronically controlled, and means you can opt for 1/8000th sec to freeze faster moving subjects, or manually set the camera to 1/2-second longer exposure for night shots, assuming the phone is stationary and supported). The layout of individual manual control sliders makes them easy to use, even if they are a little busy in terms of dominating the screen when all displayed. But we suspect most will simply use auto mode and toggle HDR on and off depending on whether a scene requires shadow and highlight balancing. In terms of results, despite the extra resolution, there's not a giant difference between G4 and G4 Plus: shots in good light are fine, while low-light causes some issues with image noise, as you'll find from almost any phone camera. So while the differences between the two devices aren't dramatic, perhaps, as budget handsets go the camera in the Moto G4 Plus is among the best you'll find at this price. Even if that price has crept up over various iterations over the years. In a sense the G4 Plus feels like a OnePlus 2. Which would have been fine, say, a year ago. Problem is the OnePlus 3 has just launched, and if you want the 4GB RAM and 64GB on-board storage version of the G4 then the potential £264 price point means Motorola doesn't quite cut the mustard. It finds itself floating between two market positions: it's not the budget purchase that the G-series has always been known for, while knocking on the door of superior middle-range models. Even some of the Plus's features don't quite make sense: the lack of NFC means no Android Pay is possible from the included fingerprint scanner. But we can't bad-mouth it as a phone in general. Motorola, now under Lenovo's command, has smoothed out design issues with earlier G-series models. But it's also changed what Moto G is about. In this new inflated 5.5-inch form and with a bunch of features squeezed into the body, it no longer serves its ultra budget role.